These Freestanding Bath Tap feature cutting edge design and are manufactured from solid brass with a stylish chrome finish. 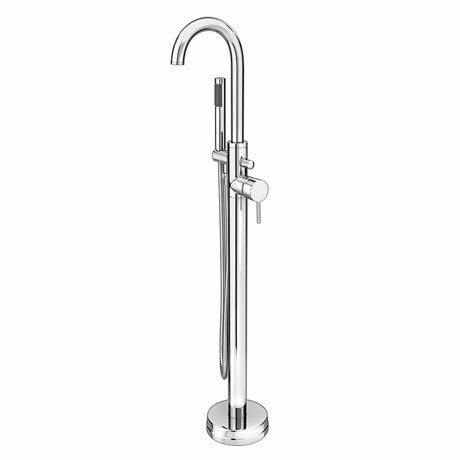 Suitable for system pressures of 1.0 Bar or greater, these freestanding taps have an curved swivel spout for elegant flexibility, complemented by a single lever handle that gives finger tip control of the temperature and flow of water. Give your bathroom a touch of style, luxury and functionality with the Cruze freestanding bath shower mixer tap. It creates a clean and contemporary style with its floor standing element, yet is also durable and robust due to its brass interior. it is perfect for complementing any bath and giving it a spa like effect. Hi Bex, flow rate is bar ltr per min 0.1 4.1 0.2 5.2 1 11.2 2 14.8. I hope this helps! Q. Can you tell me if the water supply is attached somewhere in the base of the tower? Hi Cindy. this floor mounted bath shower mixer has supply pipes which attach to the bottom of the tower. Hope this helps. Q. Please can you confirm that this tap definitely has a swivel spout? Hi Emma, yes the Cruze Floor Mounted Bath Shower Mixer has a swivel spout. Thanks. Hi Cindy - We don't understand your question here, can you ask another with full details of what you need? Q. Do you deliver to france we have a holiday home here, and we are here for a few weeks and we would like these stand taps. "Good value, seems to be built well." Looked at these taps elsewhere and were much cheaper buying here. Prompt service arrived when expected all I could have asked for.